“The best laid plans….” You know the rest. As is obvious by comparing the date of this post to the date of my last post, all of my plans to blog throughout October, Halloween and beyond sort of went by the wayside. What can I say…life happens, as it will continue to do from time to time. So, no more grand declarations of my intentions here. I hope to be around a lot more, as I have lots to say. Hopefully, time will be on my side. First, there’s a new review of mine over at Dark Scribe, where I take a look at Tom Piccirilli’s upcoming heavyweight of a collection, Futile Efforts. Great book, adequate review. Next, I got the chance to do something amazing since I last wrote here – I got to stand face-to-face with Stephen King. Yes, I was one of approximately 500 to do so on this particular night, and yes, our encounter lasted roughly 7.5 seconds, but it was 7.5 seconds of pure awesome. I attended a booksigning for King’s new novel, Under the Dome, over in Atlanta back in November (on a Friday the 13th, no less), got to speak briefly with The Man, and had him scribble his name in my Collector’s Edition copy of the brick….er, book. (It’s 1,000+ pages!) Basically, this is the guy who cemented my interest in reading, and who kick-started my interest in writing, so yeah…those 7.5 seconds were a pretty big deal. Finally, I entered a contest over at the Cafe Doom message board in October – a short story contest. The top ten finalists were chosen anonymously by posters on the board, and from those ten the editor of Dark Discoveries, James Beach, chose one tale to be published in his magazine. For some reason, he chose my story “Pun’kin,” which is now slated to appear in DD next summer or fall. I’ve published some non-fiction there before, but this is my first time cracking the fiction section, and I’m pleased and honored. I think that’s enough for now. Time to toddle off into the night, warm up by the fire, and read some good books. See ya’ soon. The contract is signed, so I’m glad to be able to announce that my flash fiction story “Sitting Up With Grandpa” will be a part of the lineup of Fifty-Two Stitches, which promises a new story a week throughout 2009, culminating with a paperback containing all the stories. I don’t know when “Grandpa” will appear, but don’t worry – there will be plenty of reminders once a date is set! You can learn more about Fifty-Two Stitches here and here. So today I got a package in the mail from Cutting Block Press. 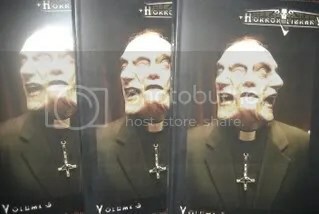 Inside were three copies of Horror Library Vol. 3, in which my short story “Toll” makes an appearance. Cracking that book open and finding my story inside was a surreal experience – one that I’ll never forget. Getting published has been a dream of mine, and a couple of years ago I decided to quit dreaming and get to work. Since then I’ve had numerous reviews, interviews, and flash fiction stories appear online, plus a couple of interviews appear in print (in the excellent Dark Discoveries magazine). And while having some of my fiction appear online was great, I’m old-school, and I hungered to see my work in print. A couple of months ago I did, thanks to Shroud‘s flash fiction contest. But I’ve known this was on the horizon, and this is what I was really waiting for – having my work in a BOOK. And I like it. And I think I want to have it happen again. So, enough celebrating. It’s back to work. Well, as soon as I plug the book, which you can preview and purchase right here.